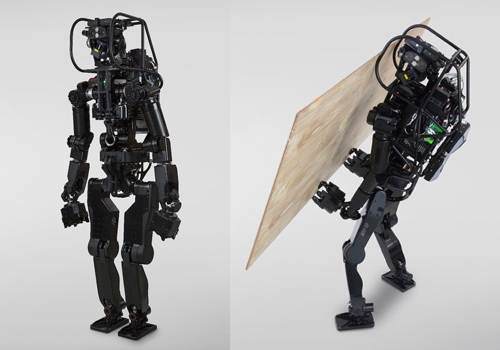 The HRP-5P robot is almost 6 feet high and weighs roughly 220 pounds. Japanese researchers incorporated advance intelligence into the robot, consisting of environmental measurement/object recognition technology, whole-body motion planning/control technology, task description/execution management technology, and high-reliability systemization technology, which is just enough technology for the robot to complete some tasks at a constructions site. AIST said HRP-5P is still in the development stage of industry-academia collaboration, it is expected that the research and development for practical use of humanoid robots could soon be transferred into the private/government sector for infrastructure projects and or assembly of large structures such as aircraft and ships. The robot will debut at IEEE/RSJ International Conference on Intelligent Robots and Systems (IROS 2018) in Madrid, Spain from October 1st to 5th. In addition, the robot will be at World Robot Expo 2018 from October 17th to 21st at Tokyo Big Sight (Koto Ward, Tokyo). "Along with the declining birthrate and the aging of the population, it is expected that many industries such as the construction industry will fall into serious manual shortages in the future, and it is urgent to solve this problem by robot technology. Also, at work sites assembling very large structures such as building sites and assembling of aircraft / ships, workers are carrying out dangerous heavy work work, and it is desired to replace these tasks with robot technology. However, at the assembly site of these large structures, it is difficult to develop a work environment tailored to the robot, and the introduction of robots has not progressed. Humanoid robots have a body structure similar to human beings, so it is possible to substitute for human work without changing the working environment and release from heavy work becomes possible." BofA's recent note titled "Watching paint dry," referred to the percentage of population aged +65, is set to explode from now until 2050, in most of the world. While Japan is demographically challenged at the moment, Karen Harris, Managing Director of Bain & Company's Macro Trends Group, discusses the collision of demographics, automation, and inequality, that is expected to displace millions of US workers in the next decade. She said the last time the US experienced a labor shift of this magnitude, it was the early 1900s when millions of workers transitioned from agriculture to industry. Turbulent times are ahead for Japan, US, and the developed world, as researchers from AIST hope to defuse the demographic time bomb with humanoid robots. Goodluck.